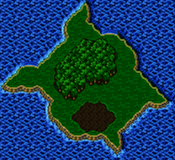 Your journey ends on this desolate isle in the middle of who-knows-where. You could wander around for days fighting the same monster over and over again. There is only one fiend on this island by the name of Pao. You may notice that he drops a Tent each and every time you encounter him. This is a small clue: use the Tent to continue with the story. There’s nothing else at all to do here. Don’t be your humble guide and stumble about wondering what to do next for two days (in my defense, I was playing in Japanese, and I don’t speak Japanese). This is not Gilligan’s Island. You needn’t wait to be rescued. Be proactive. Set up camp and get the heck off. After a small campfire cut scene Bartz must face Abductor. Make sure he’s ready. In my opinion there’s not much reason to win this fight. If you win Bartz gains 1 abp and an Ether. The story progresses in exactly the same manner if you see the dreaded annihilation message. If for some strange reason you feel inclined to attempt to beat Abductor. I suggest a blue mage capable of casting 1000 Needles. Two well-cast 100 Needles spells will finish off this purple demon. The Samurai’s ! Zeninage is even more effective! I also suggest you equip him with the Elven Mantle accessory that you picked up in the basement at Castle Walse. With the Elven Mantle in place you really only have to worry about Abductor’s Whirlwind attack, which reduces your poor hero to single digit hp. That’s the demon’s only special attack. Otherwise you just get hit for a couple 100 hp here and there. Might I also suggest placing Bartz in the back row. It doesn’t help against the Whirlwind attack, but if you actually do get hit (even with your Elfven Mantle) at least it will be half damage. The only reason to try and survive for a little while is to steal the Gaia Gear. It is difficult to steal even for a thief. I couldn’t nab it after several attempts. I’d stick to just killing Abductor. After all, you can buy the Gaia Gear when you reach Regole. Monk class worked for me. Thanks to the counterattack, Abductor was down in three attacks within two turns! Haha, the first time I stumbled on that island I used a Tent instantly after one fight with Pao. I did it because I was low on HP... never thought that it would be part of the history. Either way, when I replayed the game I noticed that if you don't use a Tent for a while (about 3 or 4 fights with Pao) Lenna would come out and say that she's tired and that "maybe" you should use a Tent. I had Bartz as a Ninja in the back row with 2 Moonring Blades and !Image--made this fight ridiculously easy.